Mary’s Meals is an international movement to set up school feeding projects in communities where poverty and hunger prevent children from gaining an education. 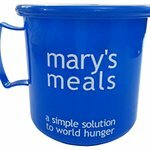 Mary’s Meals provides daily meals in school for over 400,000 children in Africa, Asia, Latin America and Eastern Europe. Mary’s Meals not only addresses the immediate needs of hungry children by giving them a daily meal, it also allows those children to receive an education that can provide an escape from poverty for themselves and their communities. Google trends for "Mary's Meals"